Randall only made his debut for Bristol off the bench last week during their loss to Saracens, but he enjoyed a healthy 30-minutes at Allianz Park. 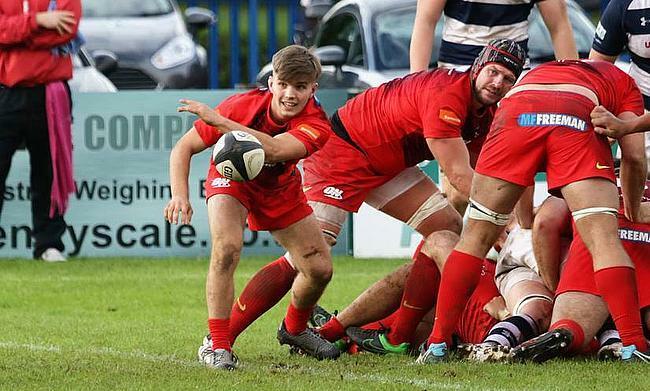 The former Hartpury student first caught the eye playing at age grade level after making the switch from Wales to England. He felt his move to Hartpury was necessary at the time as he looked to seek a new challenge. Speaking about his first taste of life as a Premiership player, Randall said: “It was nice to get on, nice to get a bit of game time. Obviously unfortunate the way the game went in the end, but I really enjoyed getting out there and getting my first appearance. "It doesn't necessarily matter about the opponent, it's just about getting out there each week and performing for the team, trying to get the wins really that will make us a Champions Cup team. “Obviously, this is my first time coming into a full-on senior environment, as I was still on an Academy contract in Gloucester, so it's just a big difference being a fulltime professional from being in an Academy. While Randall spoke of a focus on a collective team performance rather than individual work-ons highlighted by the Bristol coaching staff after his performance last weekend, it seems the opportunity of game time and his new club’s ambitions drew Randall to his Ashton Gate arrival. "The clincher was the vision of the club really,” Randall explained. “Where they want to go and where they see themselves in the future, which I was really intrigued by. It makes me want to play for the club. “There is a big vision here with where we're going, we want to be a Champions Cup team. That's where we're going as a club and hopefully, I'll be on that journey to help them get there." To qualify for the Champions Cup, Bristol must achieve a top six Premiership finish after just one season back in the top flight of English club rugby, a far cry from the usual 11th place finish most promoted sides settle for. However, while many may see this goal as overambitious, the Bears’ opening-round victory over local rivals Bath and most recent performance that pushed reigning champions Saracens closer than most, have begun to convince many that this lofty goal may not be as far out of reach than first envisioned by most viewers. Randall credits this level of performance to the aforementioned cohesiveness head coach Pat Lam has pulled together, despite the arrival of a whopping 20+ summer signings. “I think we've got a really good culture at the club. You know, we all trust in each other's abilities and I think everyone is on the same page here," Randall explained. "We know what we want out of each other and I think as long as the people in our environment are on the same page there is no reason why we can't get there. ICYMI: ?? As revealed on @btsportrugby, here's your 2?3? man squad to face @gloucesterrugby on Friday night. ?? "I think it's just a credit to the club and the players around us, we've all got a good relationship around the club and I think we all buy into what we are trying to do here. “I think that helps massively, as long as we are all buying in and on the same page, everyone's helping each other, especially the more experienced guys that were here last year. “It's a lot easier to pick stuff up when you've got your own players and mates correcting you and teaching you when you go wrong. I think it's a credit to our teammates and the culture we have here." Randall will start the clash with former side Gloucester at Kingsholm this Friday evening, paired with Irish international fly-half Ian Madigan, with the added experience of a side that boasts two All Blacks – John Afoa and Steven Luatua –Wallaby Test centurion George Smith and former Samoan captain Chris Vui. All eyes will be on the energetic youngster, who will be itching to stamp the first start of his Premiership career with a landmark victory at his old stomping ground.